Can one have too much of a good thing? Not when it comes to Michigan cherries in July. I’ve finally depleted the last of several pounds purchased with this salad. The last few blogs have included Cherry Gazpacho and Cherry-Goat Cheese Crostini. I still, surprisingly, have not had my fill of fresh cherries–eaten “au natural” or in a recipe. I’m thinking Grilled Duck Breast with Cherry Sauce next? Combine yogurt, 1 tablespoon honey or agave, walnut oil and curry powder; add additional honey to taste. 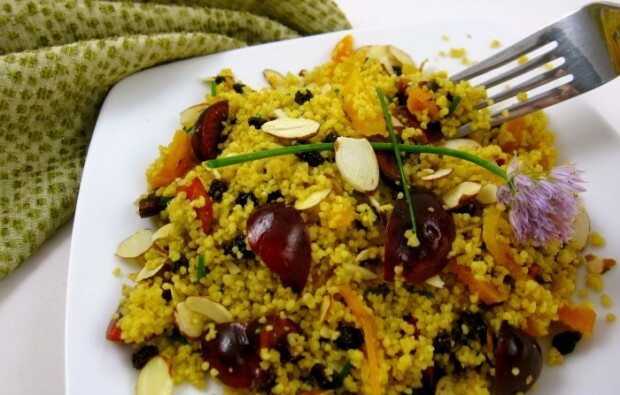 Stir in cherries, apricots, currants or raisins, almonds and chives.